We’re at the time of the year when everyone is testing out new ideas for Standard, the indecision is ripe, and many people simply don’t know what direction they want to go yet. For me, the first direction I took was towards a deck that has shown promise in the past, and even won a State Championship in 2015. That deck is a rehashed version of Fairies – Xerneas/M Gardevoir EX (PRC). The previous version of Xerneas/M Gardevoir EX was based around the versatility of being able to stream energy onto the field fast with Xerneas’ Geomancy to put 1 Energy onto 2 different benched Pokemon, building up enough to hit with M Gardevoir EX’s Brilliant Arrow for 30x the number of Fairy Energy on your field, and taking out big threats while being able to move energy around with Aromatisse XY and heal with Max Potion. Unfortunately, we did lose Aromatisse in the rotation, but despair not, the basic concept behind the deck is still here, as we lost something else with rotation as well. Currently, every form of trainer based tool removal is gone, leaving only attacks that discard/move one (Mr Mime, Mincinno) or two (Beedrill EX) tools at a time, while doing no damage in the process. This allows for more reliance on a card we haven’t seen used much in a long time – it’s the return of Exp Share. Exp Share keeps your Energy on your field by preserving any Energy from KO’d Pokemon while channeling them to something else, commonly a benched Xerneas or simply preserving them on other bench sitters such as Hoopa EX or Shaymin EX to be used to increase Brilliant Arrow’s scaling damage, or for retreat in the event of an attempted stall. In addition to this, we gain two major attackers in Steam Siege that contribute to the deck quite well – Xerneas BREAK and M Gardevoir EX (STS). Xerneas BREAK plays directly off the same concept M Gardevoir EX (PRC) functions off of – it hits 20x the total number of energy on the board, while providing a 150 HP non-EX attacker that can hold its own pretty well. M Gardevoir EX, on the other hand, provides the deck with a way to clear off useless things from the bench such as Shaymin EX and Hoopa EX, while hitting 2 relevant weaknesses in a format hyping Giratina EX and M Mewtwo EX. While it needs a Hex Maniac to hit Giratina, it’s an automatic OHKO for 2 energy, even if they have a Fury Belt. This combination of options stands to put Xerneas/M Gardevoir EX in contention with the best of them in our current format. I’ve put together a list that uses all of the cards mentioned here, in a way that I’ve found is both powerful and consistent. 4 Xerneas – This is your optimal start, and can later serve as an acceptable attacker if need be as well. Maxing this out gives you the best chance of starting it, and also gives you a better chance of finding it early if you don’t start it. Using Geomancy fast and early is your best way of strengthening your board, and boosting damage for Life Stream from Xerneas BREAK and Brilliant Arrow from M Gardevoir EX. 1 Xerneas Break – While I would like to run more than 1 of this card, I find the list is most consistent only running one and conserving it for when you feel it’s most needed. Additionally, if you want to use it more than once a game, Super Rod can give you that option as well. It’s also one of the best attackers against Giratina-EX, as it forces a 2HKO from Giratina (as would Xerneas normally), while taking easy OHKOs against them for either 5 energy on board normally, or 6 if they have a Fury Belt on it. This allows you to stay toe to toe with Giratina without having to worry about getting Spirit Links before their Chaos Wheel, or needing to overextend for Hex to attack with M Gardevoir EX. Xerneas BREAK also gives the option of a bulky non-EX attacker that can hit up to 220 on the off chance you have all of your energy on board. In my experience, scaling damage caps tend to be powerful when used properly. 3 Gardevoir EX PRC – This seems like a weird number at first, but it makes sense in the regard that you will likely never used more than 2 Megas a game, you don’t want to start it if you can help it, and running less than 4 simply increases the chances of starting Xerneas. Currently, the chances of starting Xerneas are 51%, while the chances of starting Xerneas when playing 4 Gardevoir-EX are 49%. This slight variance is the difference between starting Xerneas more than half of the time, or starting it less than half games. Opting for Primal Clash Gardevoir EX instead of Steam Siege Gardevoir EX gives you a single energy attack that can have effects on the game, however slight. Using Life Leap for 20 may seem incredibly minor, but it opens up options to take KOs with Despair Ray in following turns if you have enough Pokemon on your bench to discard. You likely will not choose to be attacking with Gardevoir EX past turn 1 or 2, so the fewer energy required for its attacks the better. 3 M Gardevoir EX PRC – As mentioned before, you likely won’t use more than 2 Megas a game, but having those 2 accessible to you is key in the event you prize any. Primal Clash’s M Gardevoir’s attack is much more straightforward than the Steam Siege variant, and potentially more powerful, as the combination of Xerneas’s Geomancy and Mega Turbos to power it up quickly. The 2 Megas also share Weakness, Resistance, and HP, so nothing is gained or lost in that regard as well. 1 M Gardevoir EX STS – As mentioned in a previous article (Found here), this card has a very unique and powerful attack in Despair Ray. Despair Ray does only have a base damage of 110, but can scale by discarding your now useless bench sitters Shaymin-EX and Hoopa-EX, helping to avoid the taking of easy prizes by your opponents and clearing space for more useful things. The scaling is often unnecessary however, as it hits for 2 fairly relevant weaknesses in Psychic and Fairy, while not having Psychic weakness like many other Psychic attackers. In a format seemingly flooded by M Mewtwo EX, this can be quite useful. In a format completely dominated by M Mewtwo-EX, I would likely drop 1 of the PRC M Gardevoir-EX for another STS M Gardevoir-EX as well, as it allows you to out-speed them for even less energy. 3 Shaymin EX – Many decks like this would normally only run 2, but I feel 3 is optimal. An Ultra Ball more commonly becomes an out to Shaymin-EX even if you’ve already used 1 or 2, which can be game changing in a format without Battle Compressor to thin out your deck, allowing you to access your needed consistency cards with more speed. Combined with Despair Ray, extra Shaymin can also be cleared off your field to boost damage and make space. 1 Hoopa EX – This is a key inclusion in most, if not all Mega based decks in this format. While 2 wouldn’t be a bad option either, 1 creates less situations in which you start Hoopa, minimizing bad starts and raising chances of Xerneas starts as well. Scoundrel Ring gives a huge out to getting your Gardevoir EX, M Gardevoir EXs, and Shaymin EX’s out for optimal setups and to be fodder for M Gardevoir EX STS if need be. 4 Sycamore, 2 N – This will likely end up being the common distribution of supporters for standard, now that Battle Compressor no longer allows for tech supporters or easy access to supporters via Compressor+VS Seeker. Sycamore is by and far the most powerful draw supporter we have to format, especially since we have several recursive cards (Mega Turbo, Super Rod) to allow for recovery of key resources. 2 Lysandre – While I have considered changing one of these to a Ranger to more easily deal with Glaceon EX and Giratina EX, it simply isn’t necessary. Both of those 2HKO Xerneas while getting either OHKO’d or 2HKO’d by it, putting the exchange in your favor already, and Giratina EX is weak to everything in your deck capable of attacking, except Shaymin EX of course. The 2 count also makes it so that you get access to them quicker. The combination of Escape Rope and Lysandre also provides a soft counter to Glaceon-EX if needed in a tight situation as well. 1 Hex Maniac – This card simply gives you options when you don’t need a draw supporter. It also gives you options to get around Giratina-EX besides simply using Xerneas, as well as a way to halt Greninja BREAK’s Giant Water Shuriken, if that were to show it’s face. 4 Gardevoir Spirit Link – This certainly seems odd to play 4 of something that can only be useful on 3 Pokemon in the deck. With no Trainers’ Mail or Skyla, these cards are not searchable, and with Super Rod, it provides situations in which 4 could potentially come in handy. All in all, 4 simply makes it easier to get your Megas out when you need them. 1 Switch, 1 Escape Rope – These provide quick outs to be able to use Geomancy when you don’t end up starting with Xerneas. Geomancy being so key to your strategy make these an absolute must, and Float Stone simply doesn’t cut it when you already have 7 useful tools that can be effectively used on anything, as well as Fairy Garden to get a Float effect when needed. Escape Rope also has the added bonus of being able to get around things like Glaceon-EX while potentially hindering your opponent. 3 Fairy Garden – While 4 would be nice to always try and counter your opponent’s stadiums, there simply isn’t space, and 3 provides the effect often enough to serve the purpose when needed. 3 does make it so you have to be slightly more conservative with them, and rarely, if ever, start the stadium war, but that’s certainly possible as it’s rarely needed for the passive effect if you manage your board properly. 3 Exp Share, 3 Mega Turbo, 1 Super Rod – Ultimately, these all provide the same end goal; managing your resources and keeping your energy strength on board. Super Rod has the added plus of getting back Megas when you’re forced to discard them early game when setting up as well. 11 Fairy Energy – Starting out testing with 12 initially, it seemed like too much, and provided too many situations when energy would get wantonly discarded during setting up. Dropping the 12th for an Escape Rope added better options while streamlining the energy count. Overall, M Gardevoir’s matchup spreads are pretty positive. Those that I think are either positive or equal are Giratina variants, M Mewtwo, Dark, Primal Kyogre, Volcanion, Greninja, M Sceptile, M Alakazam, and potentially Vileplume variants. Bad matchups tend to be M Rayquaza and nearly any Metal variant, particularly M Scizor. Giratina EX focused decks, Dark: These are heavily positive due to the capability to take OHKOs on both of these while either hitting for weakness (Giratina EX), resisting their primary attackers (Dark), or both (Darktina). Giratina EX takes 2 attachments or a Double Dragon Energy and 2 Max Elixirs to get setup, so with fast pressure and quick knockouts, Giratina EX folds pretty quickly. Dark is, as it’s always been, an all around consistent deck that can hold its own with nearly anything, but still struggles to take knockouts on Fairy Pokemon due to their resistance, and in M Gardevoir-EX’s case, high HP as well. M Sceptile, Primal Kyogre, M Alakazam: These decks predominantly count on countering the meta or surviving OHKOs. 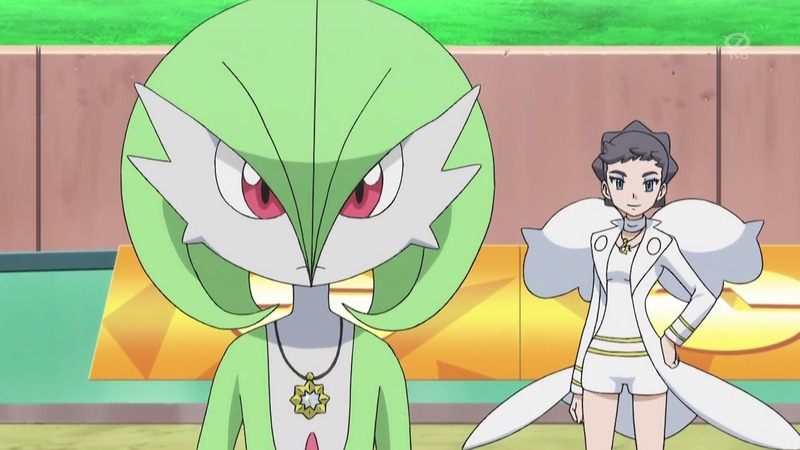 M Sceptile and Primal Kyogre are both capable of lasting more than one hit and healing off some damage to keep tanking while taking knockouts of their own, but M Gardevoir EX is one of the few things in format that can simply halt this process and OHKO them once enough energy is on board. M Alakazam is primarily a counter meta play, countering M Mewtwo-EX, and crumples to weakness to M Gardevoir-EX STS as well as normal knockouts from M Gardevoir PRC. M Mewtwo-EX, Volcanion, Greninja, Vileplume variants: M Mewtwo-EX and Volcanion are even or better due to similar mechanics; Volcanion relies on a combination of non-EX Volcanion to set up with chip damage (and even knockouts with enough Steam Ups from Volcanion EX) and Volcanion EX or Flareon EX to do the heavy lifting for larger attacks, while M Mewtwo-EX has the capability of Damage Changing with Shrine of Memories in play to keep attackers in play, or simply use Psychic Infinity to scale damage with energy for big knockouts. M Gardevoir EX can also prize exchange with non-EXs, scales damage with energy, and has the nice option of Despair Ray to take out baby Volcanion or hit M Mewtwo EX for weakness. Greninja and Vileplume both rely on abilities to affect their opponent, either through doing additive damage or hindering your opponent’s setup, but due to M Gardevoir-EX’s high HP and Xerneas’s ability to setup your board without Items, you have options to combat both strategies and stay in the game against such decks. If anyone cracks the format with a strong Vileplume variant, that could mean trouble for M Gardevoir (and any deck, really), but without Compressor around, that could be a while. Vileplume is one of the trickier ones to categorize here, as it’s no one set thing, but having options to setup under lock with attacks make it possible to stay in the game with no items at least. M Rayquaza EX and M Scizor EX are the big bad matchups for this deck. M Rayquaza EX can simply OHKO anything except Wailord EX in this format with the proper setup, and can out-speed most decks as well, making it tough to deal with. Fortunately, this matchup can be teched against with a single Parallel City- while it may not auto win you the game by any means, Parallel City forces Rayquaza to get setup again, which won’t be quite as easy without Sacred Ash around. M Scizor EX simply OHKO’s everything in M Gardevoir except Hoopa EX, making this basically an auto loss once they’re setup. Meta shifts in favor of these decks certainly make Gardevoir’s life tough, but meta shifts against these decks will make it a better play. Without a prominent rise in Metal variants or M Rayquaza EX, Gardevoir nearly always seems like a good option to play. It can be slightly teched to accommodate Mewtwo heavy metas, and has options for any non-EX decks that may rise as well. Going from the previous Battle Compressor, non-EX heavy format to a ‘slightly’ slower format that gravitates around Megas and a more heavy supporter engine will certainly prove to be an odd transition, and the decks that integrate the best combination of synergy and options will rise to the top. Xerneas/M Gardevoir is one of the most clear cut options that fits this description, and stands to adapt well for a changing format once Karen is introduced as well. It has options to trade well with Giratina EX, M Mewtwo EX, and nearly anything not Metal based in the format. That leaves M Scizor EX as a glaring weakness, but it’s simply not worth teching for and best left to the numbers game that is random matchups. Thanks for reading, and good luck with our new and improved Standard format (now with no Night March)!